An upside down tart made with apples caramelised in butter and sugar. This dessert was invented by mistake by French sisters Caroline and Stephanie Tatin who were trying to make a traditional apple pie. 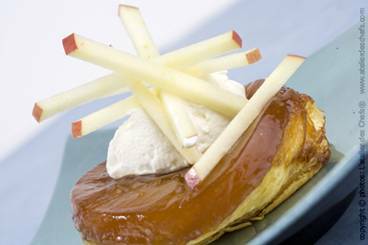 An upside-down tart of caramelised apples served and puff pastry served with a Calvados cream. A savoury 'tarte Tatin' made with purple vitelotte potatoes and smoked duck breast. A French classic - Tarte Tatin made with caramelised apples and puff pastry. Tart Tatin of caramelised pears with tonka bean and fresh ginger. This dessert is served with a pistachio crème anglaise. 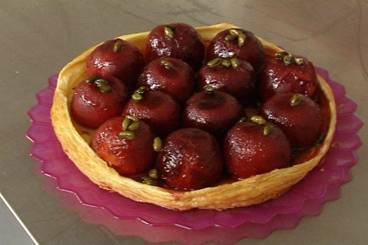 A thin, melt-in-the-mouth pastry base topped with caramelised whole prunes and pistachios. An exotic take on tarte tatin - puff pastry topped with caramelised sweet mango and zesty lime served with a passion fruit drizzle. An original tarte Tatin of black pudding on top of caramelised onion, apple and raisins. A caramelised upside down vegetable tart served with herb risotto, red pepper chutney and a fresh salad of pea shoots. An inverted puff pastry tart of plum tomatoes served with goat's cheese and fresh rocket leaves. A twist on a classic upside down apple tart, served with Calvados flavoured Chantilly cream and a butter caramel sauce flavoured with sea salt.